Hardscape design can be used hand-in-hand with landscape design to create truly beautiful outdoor living spaces for your home or business. Your hardscape—which refers to retaining walls, patios, decks and walkways—should complement your landscape to build your desired aesthetic. Whether your focus is on welcoming new customers, or building an outdoor space for throwing parties, you need to hire a hardscape company that will stick to your budget, while working with you to achieve your design and function goals. Functionally, retaining walls are used to keep soil in place. This is important, as it will keep a garden at the top of a hill from collapsing onto your patio, or a driveway from sliding down a hill into a flower garden. Essentially, retaining walls keep different hardscape elements in place. But retaining walls can be used for much more than just their function. They can, in fact, contribute much to your overall hardscape design by using textured or tinted stones. Our hardscape service experts understand this, and will work hard to make sure your retaining walls work in form as well as function. There are driveway and sidewalk options for every purpose, aesthetic and price range. Gravel driveways and sidewalks, for example, are the cheapest and most basic form. They do, however, contain quite a bit of dust and grit which is why home- and business-owners opt to spend a little more for concrete or asphalt. And, while your basic asphalt driveway might cost less in installation costs, concrete driveways will last slightly longer. For those looking to amp up their hardscape design, there is also stamped concrete—where your hardscape company will stamp designs on your concrete as it dries—which can come in many color and design varieties. One of the most beautiful driveway options, though, are paver driveways, which use bricks of asphalt, concrete and gravel to create a truly unique pattern, enhancing the overall curb appeal of your home or business. Whatever your design, price and function needs, the hardscape design experts at Allen Outdoor Solutions have the expertise to help your vision become a reality. We also specialize in maintenance and installation for patios and paver stairs. If your goal is to create an outdoor space for reading, entertaining or eating, then perhaps a patio or deck is the perfect addition to your hardscape. Patios can be as simple or as elaborate as you like—in hardscape design, the sky is the limit. Perhaps you want premium tile flooring for your patio with a pergola made of custom cut wood. Our team of hardscape designers will work with you to achieve your design goals while remaining within your budget. We’ll even help you plan for ongoing maintenance, such as refinishing the wood or checking the structural integrity of your patio periodically. A common trend lately is for homes, businesses and restaurants to have an entire outdoor entertaining area complete with a bar, sink, countertop, grill and table. There are many design options for your outdoor entertainment center, but weatherproof materials and covers are a must. We’ll guide you toward the right materials to complement your home or business’ existing aesthetic while remaining on budget. 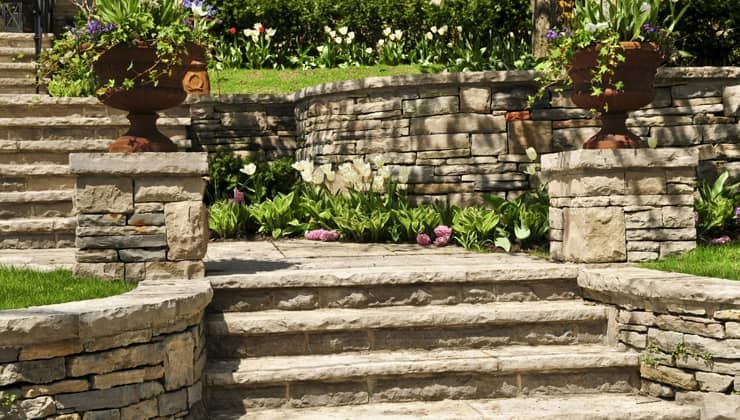 Looking to add hardscaping to your home or business? Schedule a free consultation with the hardscape design experts at Allen Outdoor Solutions today!